In this training course for Adobe Photoshop Elements 10, you will learn how to organize and manage your picture collection with this powerful software from Adobe. Expert author Jerron Smith guides you through the tools and features that are available, and teaches you how to get the most out of the software. Designed for the beginner with no experience in Photoshop Elements 10, this training course will begin by teaching you how to navigate the interface and import and organize your photos. Once you have covered the myriad of methods of organization (smart albums, tagging, stacks, rating) you will get into basic editing and correction techniques. Elements 10 offers you the ability to fix photos with tools like auto color and levels, contrast, auto sharpening, removing red-eye and more. Jerron guides you through the best use of these tools. You will then get in-depth with features such as using healing spots, working with selection tools, layers, text, painting and special effects, and finally sharing your collection. By the conclusion of this computer based training video, you will be comfortable organizing your photo collection and correcting images within Photoshop Elements 10. This video tutorial comes complete with extensive working files and images, so you can work alongside the author on the same files as he is teaching you the techniques. 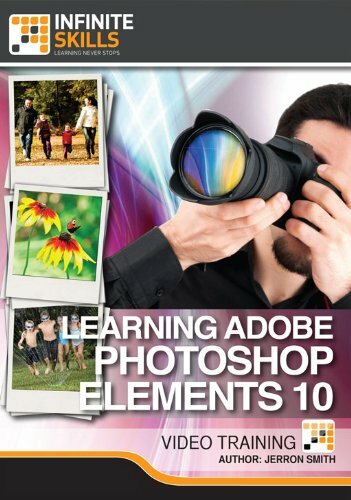 Learn Adobe Photoshop Elements 10 for Windows and Mac from a professional trainer on your own time at your own desk.